One of my earliest memories of the Christmas season is sitting on the counter licking the remnants of No Bake Cookies off a wooden spoon while my Mom, older Sister and Aunt swirled around our tiny kitchen preparing for Christmas company. The bounty of baking appeared like a Christmas miracle out of my Mom’s brand spankin’ new Avocado Green range. Along with the cookies and squares there were pies. Pies and pies and more pies! Apple, lemon meringue, raisin, chocolate and rhubarb! Everyone’s favorite pie was baked from scratch complete with a flaky crust made with lard. Yup, you heard me right, I said lard. I still think that lard makes the flakiest pie crust (I curse the day I heard about the evils of too much saturated fat!). Now where was I? Oh yes. Warm Christmas baking memories! Nowadays, Christmas baking is still one of our favorite Christmas traditions. I still leave the pie making to Grandma, because her pies are the best, but the rest of us bake cookies, fudge, tarts and whatever else tickles our fancy. With Holiday season here we thought it would be a great time to swap recipes. Post your favorites. Sweet or savory, old family recipe or new. Share the recipes you love. If you know the source of the recipe please be sure to give credit to the author. If you have a picture of your dish please send it along to Pattypie@imperfectwomen.com and we’ll post it. From Sufganiyot to Snicker Doodles, we can’t wait to see your recipes and hear about your family’s traditions! Just to add to the fun, we have 10 fabulous lightweight reusable Imperfect Women Shopping Bags that we will be giving away in a random draw. Post your recipe and you’ll be automatically entered to win. You’ll be the envy of all your friends with one of these fashionable bags featuring the new Imperfect Women logo. Well ok, maybe you won’t be the envy of all your friends, but you’ll at least be kind to the environment when you bring your own bag shopping! Patty is a busy Mom of 2 with a background in TV and Film production, and Information Technology. She is a champion of the underdog. She loves good food and to laugh out loud. She still hasn’t decided what she is going to be when she grows up. She’ll let you know when she does. Drop by spoonfuls onto a parchment paper covered cookie sheet and cool! This is a very simple way to make Popcorn Balls and most kids can’t get enough of them. This is my 87 year old Dad’s favorite at Christmas time. Air pop a very large brown grocery paper bag full of popcorn. I find the air popper creates less seeds but you can pop it using any method. Placing the popcorn in a brown paper bag allows you to shake the seeds down to the bottom. A full bag will make about two batches. Melt one stick of butter in a large kettle. Once the butter is melted, throw in a bag of marshmallows and melt those into the butter on low heat. Once melted, throw in some red or green food coloring and stir it up. Turn off the heat and slowly stir in your popcorn from your bag until the kettle is full. Then you need to butter your hands and take the mixture and form the popcorn balls and drop on wax paper or foil. The mixture is not too hot for your hands. They cool quickly. We usually make one batch of green and one of red and get around 25 to 30 each batch. My sons are in their twenties and thirty and they still ask for these as well as their friends. Every year their friends ask me to make them. They are also very festive looking if you use the food coloring. Mix &pat evenly into 9” x 13” pan. Bake @375 degrees for 15 min. Cool completely. Mix cream cheese with powdered sugar, blend in cool whip. Spread evenly over cooled crust and let set in refrigerator for at least one hour to set firm. Mix together cookie mix, oil, water and egg until a soft dough forms. Shape dough into 1 1/4 inch balls, place in muffin cups. Bake 8 to 9 minutes or until edges are set. Immediately press one Rolo into the center of each cookie cup. Cool 2 minutes. Top with pecan halves. Cool completely about 30 minutes. Makes 36 cookie cups. They are super easy too! You can change it up with whatever cookie mix and candy you want actually. These mini tarts are a big favorite at Christmas time. If I am in a rush I just use store bought mini tart shells but the pastry is very simple to make. Place flour and salt in a food processor. Over the flour scatter the cubes of cream cheese and butter. Using the pulse feature mix well. Remove mixture from the food processor and form into a ball. Place in the fridge for 30 minutes. Roll the pastry into one inch balls then pat into small tart or mini muffin pans. Place in the fridge until needed. Cut the cheese in to small cubes and divide evenly in tart shells. Combine cranberry sauce and lemon zest. Spoon over cheese. Mix together sugar and flour and cut in butter until crumbly. Add pecans then sprinkle over cranberries. Bake in oven at 375 for about 15 minutes or until the pastry is lightly browned. 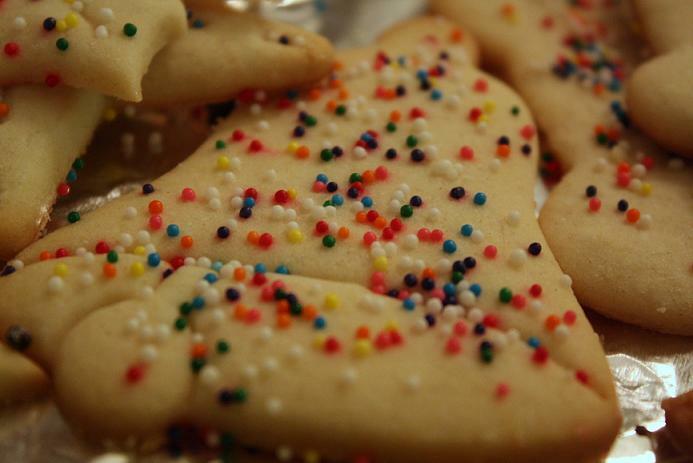 If you are making cut out cookies to decorate, use powered sugar instead of flour to roll dough out. This will keep your cookies from being heavy. Looks like this weekend I will be adding to the Slice of Pies goodies here!! Everything looks so good! Melt butter in 3 quart sauce pan, add marshmallows and cook over low heat, stirring constantly until marshmallows are melted and mixture is syrupy. Remove from heat, stir in vanilla and green food coloring. Add corn flakes, stir until well coated. Butter hands slightly, shape corn flakes into individual wreaths. Dot with red cinnamon candies. Yield depends on size of wreath. These are messy but good! This is a yummy no bake no fuss cookie pinwheel. Spread cream cheese on flour tortilla then spread a thin layer of chopped dates an a layer of chopped nuts (I use pecans). Roll up and slice. The ends won’t be exactly pin wheelish so pop them into your mouth as a tester to determine just how scrumptious this is. Remember that waxed paper is your friend when baking sticky cookies. These are my favorite cookie EVER and I only make the at Christmas because I will eat them all. Cream together butter and sugar until fluffy. Add eggs an molasses until well combined. Add spices, soda and flour. Chill dough for an hour and put in fridge between baking batches. Such great recipes! I can’t wait to try them! 1 8-oz pkg cream cheese I use the no fat kind. 2 pkgs of semi-sweet bars. Scrape cream cheese from cookies and put into a large bowl. Add cream cheese to bowl and cream together. Put remainder of cookies into a Ziploc bag and seal. Use a rolling pin to finely crush. Add finally crushed cookies to the cream cheese mixture and stir. I use well cleaned hands to mix. Melt semisweet bars in the microwave. Dip cookie balls into the chocolate and place on wax paper covered cookie sheet. Decorate with srinkles or leave plain. In a larrge bowl, break up cookie dough. Stiror knead in flour until well blended. Reshape into log. Cut cookies into 32 1/4 inch slices. Shape each slice into a ball and drop into Ziploc, shake and place 2 inches apart on ungreased cookie sheet. Bake 8 – 12 minutes or until edges are golden brown. Cool 1 minute, remove from cookie sheet to cooling rack. Snickers thanks for the powdered sugar tip! MMM, My first new one is going to be Riley’s Raspberry Cloud. I am enjoying reading these. Snickers, thanks for the tip. I have one for storing cookies. In whatever container you keep your cookies, first put in two or three slices of bread and cover them with a paper towel. The bread will absorb the moisture and become stale instead of the cookies. It keeps them nice and fresh. Where to start? That is the question. I think I have posted this Spinach Dip before but I will do it again. It is that good. One box of frozen chopped spinach. Thaw and make sure you press out all of the extra liquid or the dip will become too watery. Mix this all together and chill for an hour or two prior to serving. Great with veggies,chips, cracker and bread. Pam I make that same spinach dip but I add chopped arichoke hearts, chopped water chestnuts and about a cup of parmesan cheese. Yum!! Marnie, thanks for the recipe! I was just thinking of making fudge. I will definitely try this Toblerone recipe! Yum! Marnie, I did not even know what Toblerone was. Today I was standing in line at a CVS and I saw it. I am walking 4 to 5 miles a day and trying to lose weight so I did not buy it. What is it exactly? Toblerone is a yummy chocolate bar with nuggat(sp?) In it. Yummy!!! I make this zucchini bread a lot in the summer and fall. At Christmas time, I like to add Nestle’s chocolate chips to it for a little twist. sift flour,salt,baking powder, soda, and cinnamon together in a bowl. I thought I would add a litle snickers to the post! Cream sugars and butter, beat in vanilla, peanut butter. Hand mix in dry ingredients. Shape a small ball of dough around each candy bar, making sure bar is completley covered. Bake 12 minutes at 350. Do not over bake. Lorian, I made your wreaths, but mine came out looking more like nests! But, they still tasted good! Is there a secret to the shape? Great new recipes! I can’t wait to try! Sorry gals, I missed the unwrapping again. LOL. I am busy making candy and cookies. 🙂 I will post a few pictures soon. How about some peanut butter balls, no unwrapping. LOL. OMG, Snickers! What decadent little cookie! Snickers bars are my VERY FAVORITE candy bar. I feel cheated by the bite-sized mini Snickers. You have found something useful to do with them. I am going to try hiding some in cookies! Thanks. Patty Pie, my mom makes those no-bake cookies. I forget what she calls them, though. I have to ask her and get back to you on this thread. Does anyone here make Haystacks? Thanks Marnie. I was wondering about that because we make “Turtles” by taking one package of butterscotch chips and one package of choc chips and melting them down and then stirring in whatever kind of nuts you like and dropping them on wax paper. They are good. I will have to try the Fiber 1 cereal. I think I would like them with coconut also. You can also use chow mein noodles and salted nuts to make Haystacks. In a large saucepan, combine cranberries, sugar, apple juice, vinegar, and cinnamon stick. Push cloves into lemon and add to saucepan. Bring to a boil, reduce heat, and simmer about 20 min. You can also substitute some of the apple juice for some booze and make boozy berries! oohhh I’m trying Pam’s version!! LOL, Boozy Berries! Where is Jennie? I think she might enjoy those. We make our haystacks out of chow mein noodles and peanuts. Fibre One would be healthier. I’m trying that this year. Where is Nancy? I still make the “turtles” she posted years ago at GDNNOP. Make these after you’ve made something else in the oven, when it is still warm, but not on. 3. Place them in the warm oven for just a few minutes, until the Rolos are soft and glisten. 4. Take them out of the oven and top each with a pecan half, squishing it down into the Rolo. 5. Let it cool and harden. We put ours right in the fridge because we are impatient. Thanks for a great new tradition, Nancy! Shhh! Don’t tell. I am using the Pillsbury sugar cookie dough this year. It was on sale. Cheri, not sure, maybe let it cool a bit longer. Or just christmas nests? LOL They sure do taste good. This is an hors d’oeuvre that my family enjoys. Put oven rack in middle position and preheat oven to 450 degrees. Stuff 1 piece of cheese into each date, then wrap 1 piece of bacon around each date, securing it with a tooth pick. Arrange dates 1 inch apart in a shallow baking pan. Bake 5 minutes, then turn dates over with tongs and bake until bacon is crisp, 5 to 6 minutes more. Drain on a paper bag or parchment. Serve immediately. Over a double boiler or in micro wave, melt the chips together, add the nuts and chips, stirring to coat. Place in small muffins tins holders lined with papers. You would never know there is pototoe chips in these. The salt and sweet together are yummy. Set in frig or a cool place until firm. These store well. For those of you who tire of chocolate – these are time consuming but really good. Beat butter with electric mixer on med to high about 30 seconds. Add granulated sugar. Beat till combined, scraping bowl. Beat in 1 tablespoon of water and vanilla till combined. Beat in as much flour as you can with mixer. Stir in remainder flour and pecans. Shape dough into 1 inch balls or 2 1/2 inch logs. Place 1 inch apart on ungreased cookie sheet. Bake at 325 degrees. for 20 minutes, or till bottoms are lightly browned. Transfer to rack to cool.Gently shake cooled cookies in a plastic bag with the powdered sugar,. Makes about 36 cookies. My sister-in-law is the best cook. Everything is from scratch. Mix together well, shape into 1 1/2” size meatballs. Bake in 325 degree oven for approx. 25 min. Heat over med. heat until jelly melts. Add meatballs and simmer for about 30 minutes. Can also be heated in slow cooker. I also have a friend who makes her meatball sause from hot salsa and grape jelly and it is very good. This is a great recipe for having a group of people over to play games on New Year’s Eve. Serve with several different choices of cheese. Trim the meat of most of the fat and brown it in a frying pan. Place it in the Nesco and sprinkled it with a package of dry onion soup mix. Cooked it on 325 degrees for about 2 ½ to 3 hrs or you could do the same in the oven with a heavy pan with a lid. Drain the fat shredded it apart with a fork. Put it back in the pan add a can of cream of celery soup or you could use cream of mushroom instead. Add part of a can of beef broth to keep it moist . Mix it up and reheat..
An easy gift I give to the mailman, paperboy etc. Melt butter. Add sprices. Add nuts & spoon ingredients over nuts. Toast in a pan in 375* oven for 12 mins.- until brown. Shake pan often to prevent burning. Drain on brown paper. I changed that HB just in case someone missed your alert. Lots of delicious recipes on this thread. Thanks so much for everyone that is participating. Hi Ladies! We have enough reusable shopping bags to send one to everyone who submitted a recipe. Just sent me your address and we will get them in the mail to you! Where are the peanut butter balls? It’s not Christmas without them, in my opinion. Here is my recipe for them. Mix first four ingredients. Roll into 1 inch balls. Melt chocolate, in a double boiler.Dip balls 1/2 way down into chocolate. Put in refrigerator to harden. This is sweet but oh soo good. P.S I dont need a bag, just wanted to share. Oh I saw snickers and turtles. I found this recipe. I haven’t tried it yet but it sounds good. If you try it let me know how it is. Hi Lynn, hope you are feeling well. I am making peanut butter balls, but my receipe is different. Will post it this weekend. Good to see you!! I am doing good. Thanks for asking. Think pink in a few months. In large saucepan over medium heat, cook cranberries, sugar and port to boiling, stirring occasionally. Reduce to low heat, cover and simmer about 5 minutes until berries pop. Meanwhile, in small cup, blend cold water and cornstarch until smooth and gradually mix into hot cranberry mixtre. Cook, stirring constantly, until mixture thickens. (It will thicken more after refrigeration.) Keeps indefinitely. Makes about 3 cups. We have this in the fridge all year… It’s delish on chicken, too! Here is a Holiday Favorite in my house. This recipe freezes well and makes nice gifts. Cream sugar and shortening. Add eggs and canned pumpkin. Mix well. Sift flour, powder, soda, salt, cinnamon and all spice. Add nuts and water. Mix all well. Pour into greased and flour pans. Either two large loaf pans or three small loaf pans. Bake 60 minutes at 350. 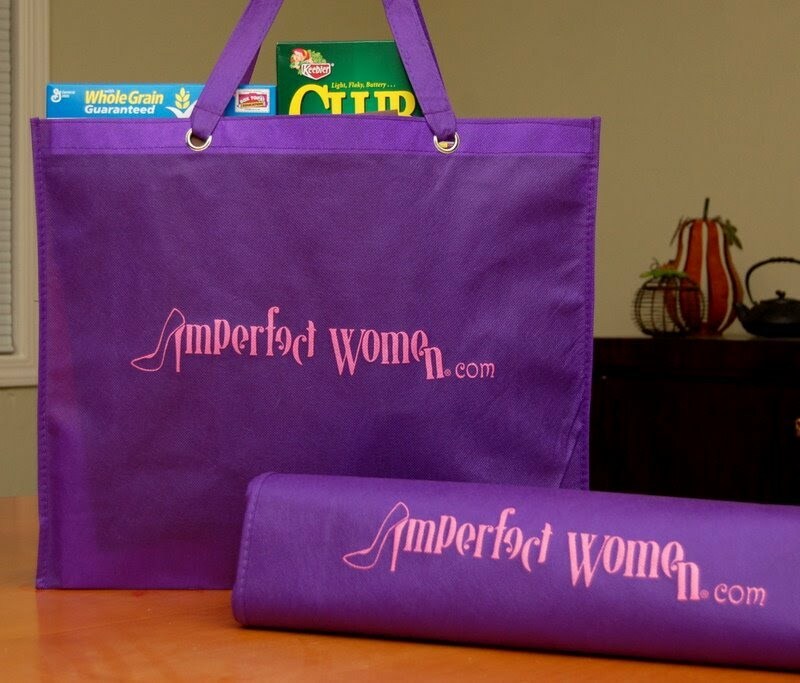 Just a reminder, for anyone who participated in this thread and would like an Imperfect Women shopping bag, please email your information to info@imperfectwomen.com if you haven’t already given it to Pattypie. Ann, I still need to make Nancy’s turtles – those are SO good! And super-easy. I meant to say I made the Toblerone fudge a week or so ago – thanks for the recipe, Marnie – it was yummy! Wishing the Slice of Pie and her family a Merry Christmas and hope she is feeling better. Ann — I’m here! I’m here! Been crazy at work and now I’m off until after the 1st. It’s 1am and I’m waiting to take out my last pumpkin bread loaf. Been baking for hours. Thanks for the pumpkin bread recipe. I had this site open and decided to whip some up rather than look for another recipe that I used. We’ll eat it tomorrow morning. I’ll let you know how it is! #68, Ann, just wondering how you liked the Pumpkin Bread? HOpe you enjoyed. I always make a pig of myself with it. Oink Oink. Ok ladies, for those who emailed their addressed, your bags are packaged up and will be mailed tomorrow. Sorry for the delay but I did not expect to get this flu bug. Wow, it is nasty. Roozerdo, I will make sure Ann sees your comment. Thanks everyone for making this thread so great! Thanks Pam and the IW ladies for the neatest purple bag that hit my mailbox. Want you to know, I will be tugging that bag full of magazines and some good treats to visit all the females that are taking chemo next week, to let them know we are all Imperfect Women! I spend the day with a friend who is under going treatment for breast cancer, and I share all my stuff with others. That purple just will make things pop! Thanks again! It’s great for hauling Christmas gifts to the in-laws, or taking my loads of teaching supplies to schools. My students who are little girls love the bag. I think they like the color, but they also get a little vocabulary lesson on what “imperfect” means, and our little philosophy on being supportive and kind even when we disagree. I never told you how much we loved teh pumpkin bread. In fact, I still have a loaf (I made several for Christmas week) left in the freezer for tomorrow morning. It is a DELICIOUS recipe! Snickers, Glad you like it and are able to use it.